If you visit Siesta Key for a vacation, you can plan on being at the beach much of the time. Hanging out at the island’s incredible white sand beaches is one of the most popular things to do for both tourists and locals. The famous white sand on the beaches of Siesta Key is thought to originate from the Appalachian Mountains, and over time it flowed down through the rivers and deposited along the beaches of the island. The beaches on Siesta Key are known for their calm and swimmable waters and for being a popular location for water sports. It helps to plan out your next trip to the beach when you’re visiting Siesta Key on a family vacation, and you’ll find some useful information below that can help you prepare. The weather on Siesta Key varies slightly throughout each season, but during most of the year you will find the island’s beaches to be pleasant and warm with swimmable water. The Siesta Key area gets more precipitation than most of the country with 53 inches of rain per year, while the average throughout the United States is 39. In the winter months, the temperature of the gulf water hovers around 65 degrees Fahrenheit which is not a comfortable temperature for most but may be suitable for some of the hardier swimmers. The air temperature stays at around 74 degrees on average, making most days very comfortable if you enjoy relaxing on the beach or exercising outdoors. The temperature of the gulf water starts to rise to an average of around 76 degrees in the spring, making it comfortable for the majority of people, while air temperatures rise up to an average of around 85 degrees. This is a great time of the year to visit as the beaches are less populated while the weather is still pleasant enough for beach outings and swimming. 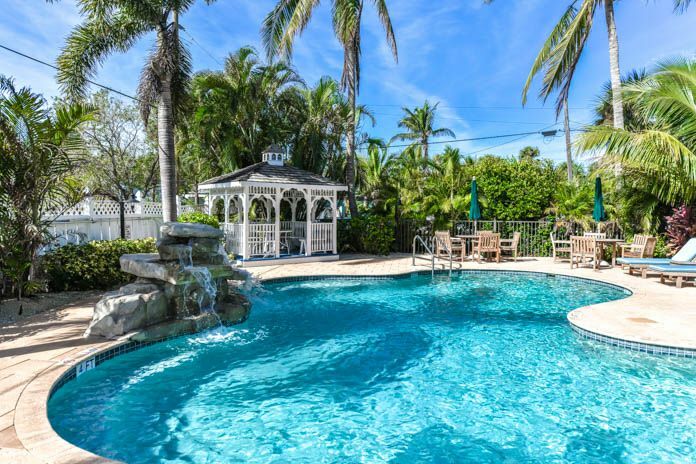 The summer months are the warmest and some of the most popular on Siesta Key with air temperatures that sit around an average high of 91 degrees Fahrenheit, while water temperatures are around 86 degrees. This makes swimming very pleasant and enjoyable on just about every day of the summer. Summers can be hot and humid during some days, but frequent thunderstorms help to cool things off as well as ocean breezes. You can walk to Sunset Pointe from the Tropical Breeze Resort. It is a popular spot on Siesta Key Beach to watch the sunsets and is on the quiet end of the island. Check the weather – If you plan on visiting the beach, be sure to check the weather ahead of time for forecasted rain. On the humid days, you’ll want to dress for it, as high humidity will drive up the heat index and make even lower temperatures feel more uncomfortable. Rent beach equipment – Many beach items can be rented such as beach umbrellas, beach wheelchairs, chairs, skim boards, boogie boards, strollers and snorkeling equipment. Bringing this equipment with you on your trip to Siesta Key can be a hassle, and it is usually much more convenient to rent the equipment as needed once you arrive. 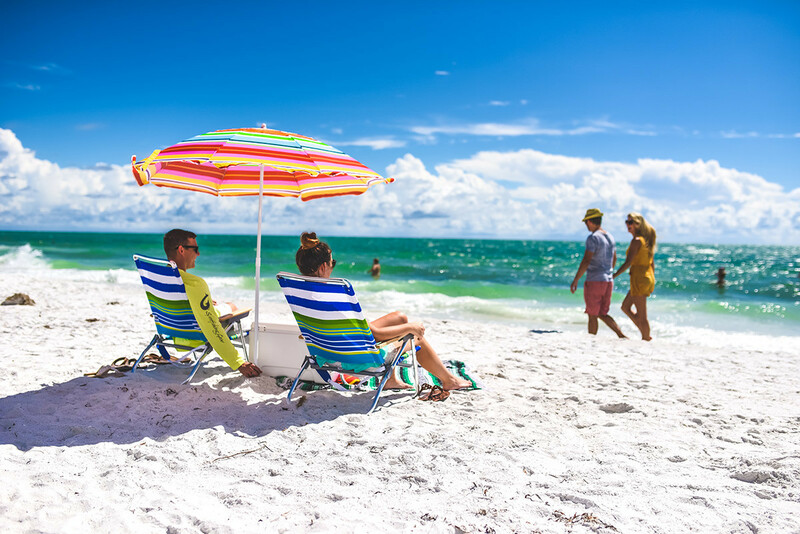 Get there early to guarantee parking – Although there are hundreds of parking spaces at Siesta Beach and the other top beaches on the island, you will want to arrive early to ensure that you have the best chance at a space. One major benefit of staying at Tropical Breeze Resort is the fact that you’ll be able to walk to the beach anytime that you want and can avoid the hassles associated with finding a parking spot. 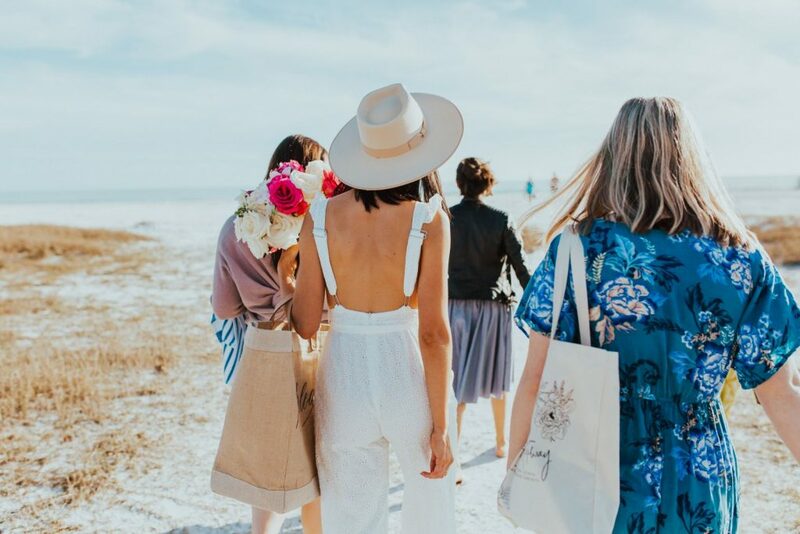 Bring food just in case – Although many of the beaches on Siesta Key have concession stands or restaurants nearby, some of them certainly don’t, so it can help to bring a cooler with some food and snacks with you just in case you’re not able to get a place to eat. Don’t assume lifeguards will be there – Another important consideration for those with children is the fact that lifeguards are not guaranteed to be at the beach you choose go to. Although the public beaches like Siesta Beach have lifeguards available throughout the year, the other beach access points often do not have lifeguards nearby. Carefully monitor your children if you choose to swim, and the best option for families is Siesta Beach with its lifeguards, even though it may be crowded. When you stay at Tropical Breeze Resort you will be located right in Siesta Village where you can enjoy top rated restaurants, exciting shopping, spas, and other attractions. Siesta Beach, one of the top beaches on the island, is a short drive, walk, or jog away. There are also several other beach access points nearby that are much less crowded than Siesta Beach if you prefer. To get more information about booking accommodations near Siesta Beach or planning for your next beach outing, call Tropical Breeze Resort today at (941)-349-1125.